London-based art dealer Adrian Sassoon believes that the artwork on board a superyacht should be as bespoke and luxurious as the yacht’s nautical and technical features. “Our unique, contemporary works of art in ceramics, glass and precious metals will complete any glamorous onboard interior,” he says. A fervent champion of some of today’s most ground-breaking artists, the dealer undoubtedly has an eye for detail and design. The gallery promotes artists by arranging major shows throughout the UK and exhibiting at the world’s most prestigious art fairs, including TEFAF in Maastricht and New York and Masterpiece and the Pavilion of Art and Design in London. 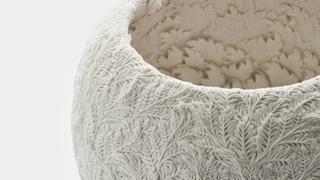 Notable among these artists is Hitomi Hosono, who creates detailed unglazed porcelain vessels with a chalk-like finish that reference the natural world and botanical specimens. Hosono has attracted the patronage of curators from the British Museum and Victoria and Albert Museum in London, as well as discerning private clients internationally. 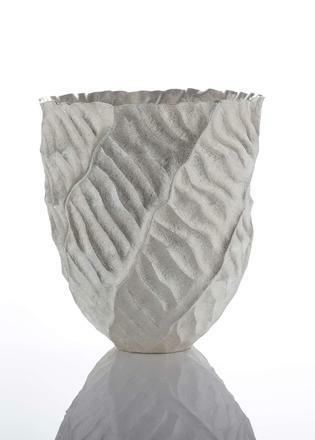 Sassoon also represents Hiroshi Suzuki, one of the world’s greatest silversmiths, who masterfully employs traditional techniques of hammer-raising silver to create vessels with interesting sculptural surface patterns. Also championed by Sassoon is Michael Eden, a designer who creates historically inspired, 3D printed sculptures in nylon and other materials. His dynamic, often humorous work is favoured by museums internationally and has recently been acquired by the Los Angeles County Museum of Art. 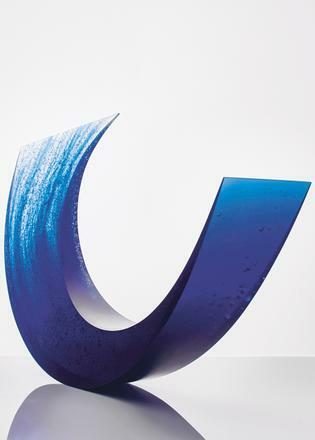 Sassoon also represents Galia Amsel, a British artist living and working in New Zealand, who casts dynamic, unique and highly coloured sculptural forms in glass. The power and motion of the sea often inspire her work. These are to name just a few of the talented artists that Sassoon has assembled throughout his career; artists who work in a diverse mix of materials, ranging from ancient hardstone to porcelain, glass, lacquer, silver, gold and paper. 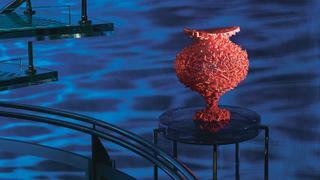 Each continues to be highly coveted by a broad range of collectors, museums and interior designers worldwide. Sassoon’s passion for the arts began with his grandmother, an eminent collector of paintings and furniture; she filled the family home with international rarities by renowned artists and craftsmen. It was this collection that first instilled in the British art dealer a particular passion for finely detailed, 18th century French ceramics with royal patronage. Collecting and study, together with a wealth of experience gained through five years working as a curator at the J Paul Getty Museum in Los Angeles, led to Sassoon establishing an art dealership in his name. Initially specialising in antique Sèvres porcelain, Adrian Sassoon is now the UK’s leading gallery for international, contemporary, decorative works of art, with an enviable reputation for innovative, luxurious objects for yachts. Collaborating with private clients and designers to ensure the most beautiful, practical and unique artworks are placed on board, this has become a key component of his work. Over the years Sassoon has helped to supply pieces to superyachts varying from 35 to 156 metres in size. While the Knightsbridge gallery holds a wide variety of artworks, there is also the option to commission one of the artists to create a bespoke piece. “This is a wonderful option for a discerning client, someone aiming to achieve something site-specific and of the utmost quality,” says Sassoon.